On Monday, the sentiment surrounding the top 10 cryptocurrencies by market capitalization is more positive than a week ago, according to Predicoin, a crypto market sentiment analysis service. 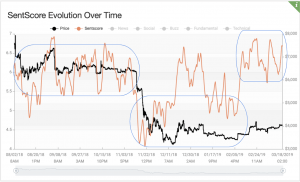 Moreover, Bitcoin Sentscore seems to be back to the range it had before mid-November crash, according to Pierre-Alexandre Picard, co-founder and CMO of Predicoin. Meanwhile, the average market sentiment score among the top ten today is 5.65, again higher than last week (5.43) and marking yet another improvement on a week-by-week basis. For Bitcoin, it’s fourth Monday in a row with the highest score (6.7) out of the top 10. 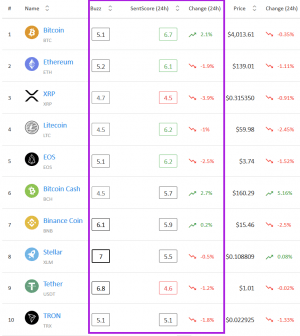 Bitcoin Cash (5.7) and Stellar (5.5) made it onto the winning list this time, joining the same winners as last week: Bitcoin (6.7), Litecoin and EOS (6.2 both), Ethereum (6.1), and Binance Coin (5.9). This is Stellar’s first time on the winning list since we started these weekly updates in February 2019, and only its second time above the negative range. Part of the buzz, which shows the intensity of social interest for a coin, around Stellar comes from the fact that the congregation of payments, FinTech and financial services industry called the Money 20/20 conference in Asia is due to start tomorrow, March 19th, and will feature Stellar’s co-founder Jed McCaleb as one of the speakers, Picard suggested. Also, it is expected that Stellar will make a joint announcement with information technology giant IBM, as Jesse Lund, IBM’s Head of Blockchain and Digital Currencies, will join McCaleb on stage. Meanwhile, despite an increase, XRP still has the lowest score of 4.5, which marks the line between the negative and neutral zones. The last time this coin has entered neutral territory was February 25th, when it managed to get a score of 4.7. 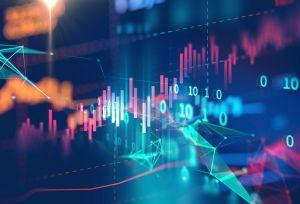 The neutral list holds Tether (4.6) and TRON (5.1), where the former dropped compared to last week, while the latter rose. Tether’s drop can, at least partially, be attributed to the news that its USD 2 billion token supply is now backed by not only real US dollars, but other assets, also, according to Picard. Bitcoin Cash and XRP are both winners in the weekly change category with 8.7% improvement compared to last week. Bitcoin Cash found its strength in news, which got a score of 7.8, while its weakest spot are fundamentals with 3.1. XRP’s score explains its total score and why it’s so low: news are again on their side with 6.4, but the technical side only scored 2.3. 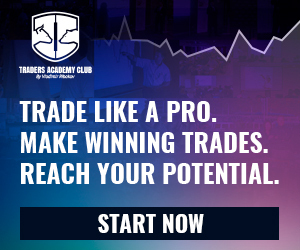 The biggest loser is Binance Coin with a drop of 1.8%, followed by Ethereum with -1.6% and Bitcoin with -1.5%. However, all of them still remain on the winning list. Binance Coin’s strength is technical, with 7.5, while its weakness is fundamental – 3.7. Ethereum’s strength is also news with 6.4, but weakness is also technical with 3.5. Bitcoin’s fundamentals are soaring at 8.6, while the social aspect – at 4.5 – leaves something to be desired. LEO CEO Dan Andersson arrested in Pakistan?